July 17 (bonus bash): Jackyl, Stryper, Kix, Bobaflex, Red Partizan, Rachlen Lorin, Silvertung, and Streetlight Circus. July 18: Evanescence, Mastodon, Skillet, Starset, Of Mice & Men, Static-X, DevilDriver, Sylar, Dope, Rachel Lorin, Revenant Soul, Gabriel And The Apocalypse, Sweet Addiction, The 9th Planet Out, Madman’s Diary, Bleak Sabbath, The Zealots, Cold Kingdom, Krashkarma, Stare Across, and Un-Broken. 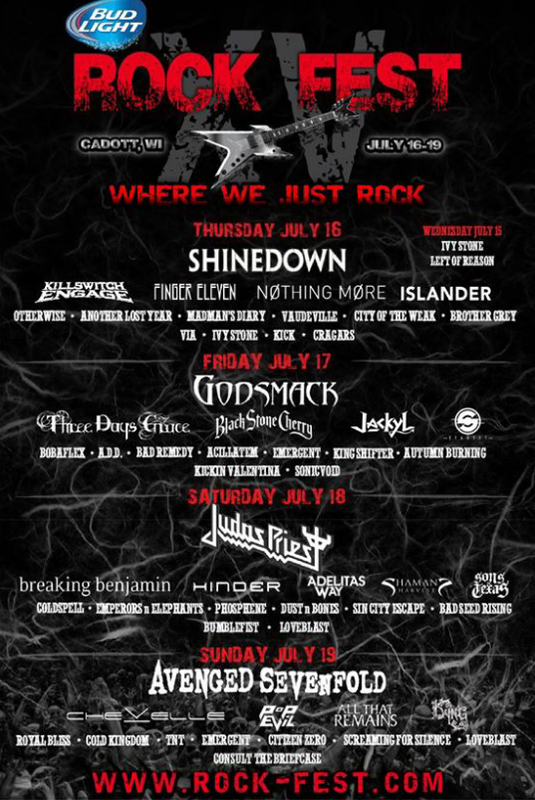 July 19: Five Finger Death Punch, Breaking Benjamin, Three Days Grace, Killswitch Engage, Asking Alexandria, Bad Wolves, Ice Nine Kills, From Ashes To New, I See Stars, Shallow Side, Helius, Stormbreaker, Days To Come, Sin7, Who’s Who, Stone Type Pilots, Ignescent, Beyond Unbroken, Mouthz Of Dirt, and Catechize. July 20: Rob Zombie, Marilyn Manson, In This Moment, I Prevail, P.O.D., Lacuna Coil, Red Sun Rising, Hyro The Hero, Joyous Wolf, Eve To Adam, Jacob Cade, The Rumours, Lydia Can’t Breathe, A Light Divided, Piranha, TNT, Roxz, Neverwake, Standing Alliance, and Electric Revolution. The lineup has been revealed for the 2016 Rock Fest. The event is set to take place in Cadott, WI, on July 14-16. and it will include: Slipknot, Hollywood Vampires, Alice In Chains, Five Finger Death Punch, Marilyn Manson, Breaking Benjamin, Rise Against, Bullet For My Valentine, Skillet, Queensrÿche, All That Remains, Scott Stapp, In This Moment, Sick Puppies, Led Zeppelin 2, Saint Asonia, Escape The Fate, Atreyu, Kix, 10 Years, Highly Suspect, Nothing More, Red Sun Rising, Like A Storm, New Years Day, Faster Pussycat, Wilson, Bobaflex, Art Of Dying, I Prevail, Bridge To Grace, Stitched Up Heart, Wayland, 3 Pill Morning, Beyond Threshold, TNT, Maiden Minneapolis, Electric Eye, Acillatem, Nivrana, Who’s Who, Prophets Of Addiction, Seven Days Lost, The Black Fires, Station, Every Mother’s Nightmare, Chaotic Resemblance, Screaming For Silence, Silversyde, Antistar, Dellacoma, Veilside, Gabriel And The Apocalypse, Vaudeville, Malice, Oblivious Signal, Fatal Kaliber, Cold Kingdom, Emissary Echo, Smiling Politely, Bad Remedy, Strange Daze, Aeraco, Myrrya, Truth Before Treason, and My Memory Remains. 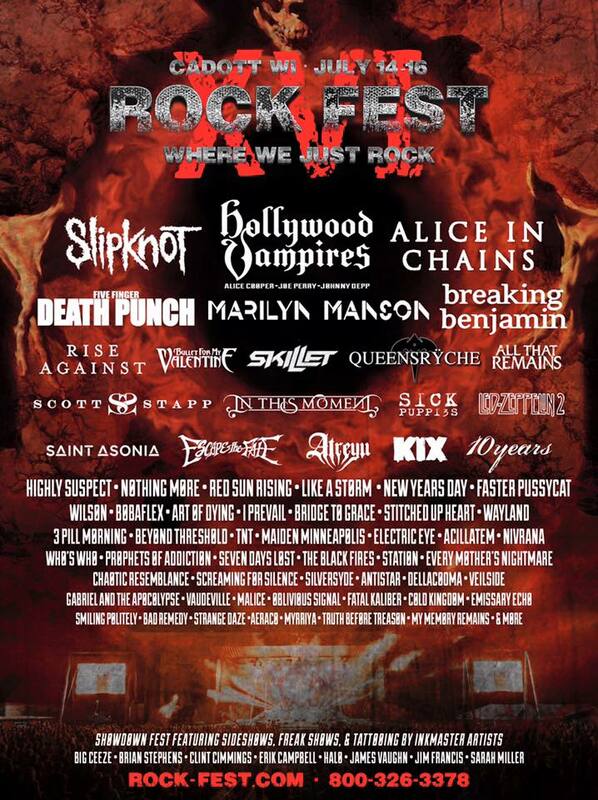 Godsmack have been added to the 2015 Rock Fest. The band will be replacing Nickelback, who recently cancelled their whole tour. The festival will take place July 16-19, in Cadott, WI and will also include performances from Avenged Sevenfold, Judas Priest, Shinedown, Breaking Benjamin, Black Stone Cherry, All That Remains, Three Days Grace, Kyng, Pop Evil, Killswitch Engage, Hinder, Shaman’s Harvest and many more. The lineup has been revealed for the 2015 Rock Fest. 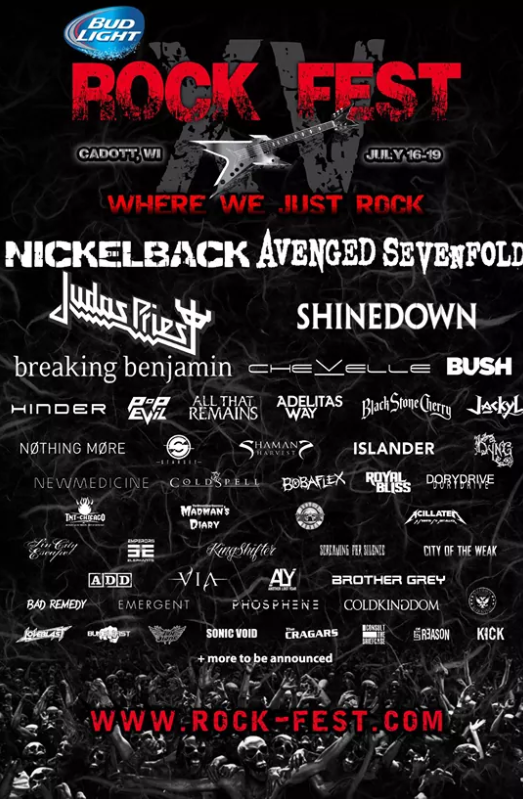 The festival will take place July 16-19, in Cadott, WI and will include performances from Avenged Sevenfold, Judas Priest, Nickelback, Shinedown, Breaking Benjamin, Black Stone Cherry, All That Remains, Pop Evil, New Medicine and many more.